The Garland Science website is no longer available to access and you have been automatically redirected to CRCPress.com. All instructor resources (*see Exceptions) are now available on our Instructor Hub. Your GarlandScience.com instructor credentials will not grant access to the Hub, but existing and new users may request access here. The student resources previously accessed via GarlandScience.com are no longer available to existing or new users. Please accept our apologies for any inconvenience this may cause. Exclusive web offer for individuals on print book only. Terms & Conditions may apply. 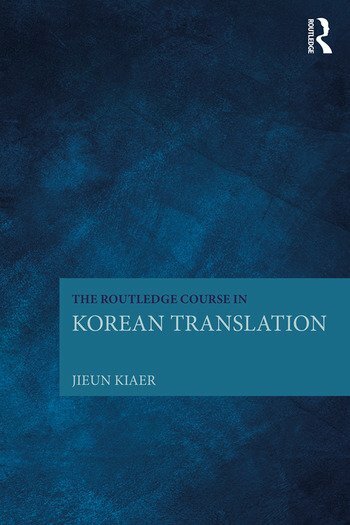 The Routledge Course in Korean Translation brings together for the first time materials dedicated to the theory and practice of translation to and from Korean. This advanced course in Korean translation discusses cross-linguistic and cross-cultural issues that arise in the course of Korean-English and English-Korean translation and offers useful tools for dealing with the problems that arise in the actual practice of translation. Equipped with examples from a range of genres, this book provides a foundational understanding in translation theory that is necessary in Korean translation. The Routledge Course in Korean Translation is essential reading for students of Korean at both undergraduate and postgraduate levels interested in translation, as well as for students and researchers with knowledge of Korean who are interested in linguistics, and cultural and comunication studies. Jieun Kiaer is Young Bin Min-KF Associate Professor of Korean Language and Linguistics at the University of Oxford, UK. We provide complimentary e-inspection copies of primary textbooks to instructors considering our books for course adoption. CRC Press eBooks are available through VitalSource. The free VitalSource Bookshelf® application allows you to access to your eBooks whenever and wherever you choose. Mobile/eReaders – Download the Bookshelf mobile app at VitalSource.com or from the iTunes or Android store to access your eBooks from your mobile device or eReader. Offline Computer – Download Bookshelf software to your desktop so you can view your eBooks with or without Internet access. What does "CPD Certified" mean? CPD consists of any educational activity which helps to maintain and develop knowledge, problem-solving, and technical skills with the aim to provide better health care through higher standards. It could be through conference attendance, group discussion or directed reading to name just a few examples. Use certain CRC Press medical books to get your CPD points up for revalidation. We provide a free online form to document your learning and a certificate for your records. © CRC Press, Taylor & Francis Group, an Informa Group company. Product pricing will be adjusted to match the corresponding currency. The title will be removed from your cart because it is not available in this region. This will help us determine what currency and product offerings to display.